Info and Stats - The 2nd largest of the Pentecostal Bodies are Assemblies of God (2.5 Million in USA) and Churches of God in Christ (3 million in USA) is the Largest Pentecostal Body in United States according to Denominations Comparison (Rose Publishing, 2003). Church of God (Cleveland, Tennessee), which is prominent in the South, had 890,000 membership in 1999. "Pentecostalism is a modern American Christian Movement that emerged out of the Holiness Movement at the turn of the century. Two key figures in the beginning of Pentecostalism were Charles Parham (1873-1929), the founder of Bethel Bible College in Topeka, Kansas, and William Seymour (1870-1922) , an African American Holiness evangelist from Louisiana. Parham became convinced that the gifts of the Holy Spirit that were evident in apostolic times are available to Christians in modern times as well. Of particular interest was speaking in tongues, the first incident which occurred at Bethel Bible College in 1901 when one of the students, Agnes Ozman, spoke in tongues. It was concluded, then, that speaking in tongues was the evidence that one had been baptized by the Holy Spirit, and henceforth came to be the distinctive doctrine of the Pentecostal Churches, differing them from the Holiness Groups. For this reason, the experience has been called the beginning of the modern Pentecostal Movement. Five years later, Seymour, who had studied at bethel with Parham, led a revival on Azusa Street in Los Angeles that lasted for several months. This led the ground work for the Pentecostal Movement spreading across America. Pentecostal Doctrine came to be known by the term 'FULL GOSPEL' or the 'FOUR SQUARE GOSPEL', which stresses Christ's ministry as four-fold: Christ the Savior, the Sanctifier, the Healer, and the Coming King. Some of the more common Pentecostal or 'Charismatic' Churches that arose out of this movement were: Assemblies of God, Pentecostal Churches, Independent Pentecostal Churches, Full Gospel Churches, Four-Square Gospel Churches, United Pentecostal Churches, or 'Jesus Only' (which deny the Trinity); Churches of God (Cleveland, Tennessee) with 890,000 members in 1999; Church of God of Prophecy, Apostolic Faith Churches, Church of God in Christ, Elim Fellowship Churches, Vineyard Churches International (which played a big role in the founding of The Promise Keepers Movement; Church of the Living God, and others. The Assemblies of God was formed in 1914 when a group of churches joined together at Hot Springs, Arkansas. Assemblies of God broke away from the Holiness Churches, because they believed, as other Pentecostal Churches, that The Baptism of the Holy Spirit was evidenced by speaking in Tongues. Assemblies of God also did not believe ENTIRE SANCTIFICATION or SINLESS PERFECTION occurred at this 'Second Blessing' of the Baptism of the Holy Spirit. Assemblies of God are Pentecostal in doctrine, stressing speaking in tongues, divine healing, women pastors, slain in the Spirit, and their theology is Arminian, meaning they believe salvation can be lost. They are very ecumenical in their associations and cooperation, and encourage the use of the newer Bible versions. Unlike, their Holiness forefathers, they do not hold to the strict guidelines on dress, women's hair, make-up, etc. as do other Holiness Churches. Church services are very informal, avoiding the dry, formal, ritualistic liturgy of many mainline denominational churches. Music is more of a contemporary nature, and absent is the dry, old fashion singing of hymns nowadays. People feel free to dance during the service and go to the altar when desired, and praise God in a heavenly prayer language of 'tongues.' Services tend to be very emotional. Emphasis is put upon Music in Assemblies of God, as well as the preaching. Local churches are independent in polity and in conduct of local affairs. The government of the assemblies is an unusual mixture of Presbyterian and congregational systems. District officers have a pastoral ministry to all the churches and are responsible for the promotion of home missions, and each district has a presbytery that examines and recommends credentialing of ministers. The General Superintendent and other general church officers serve at the national headquarters in Springfield, Missouri. There are several Biblical HERESIES which are prevalent in the Assemblies of God churches. For example: they teach that you can lose your salvation. They also practice the unbiblical confusion of speaking in tongues. 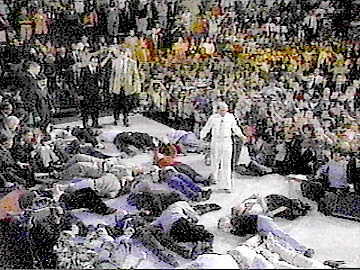 In addition, the Assemblies of God (Pentecostals, etc) are known for their hands-on faith-healing services. One of the biggest wolves in the Assembly of God camp is Morris Cerullo. Other wolves within the Assemblies of God religion are John Harris, Jim Bakker, Tammy Faye Bakker, Byron Klaus, Gene Scott, Bill Hamon, Jimmy Swaggart and Karl Strader (the tip of the iceberg of many scoundrels in the Assembly of God denomination who use the sheep for their own gain). Some of the other ecumenical leaders in the Assemblies of God mess are Dr. Henry J. Lyons; Billy, Ned and Franklin Graham; and Robert Tilton to name a few. Elvis Presley was also a member of the Assemblies of God. 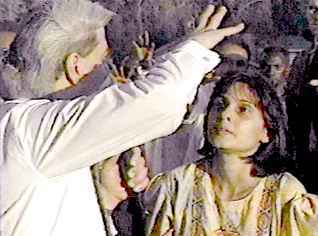 Benny Hinn, one of the most hideous false prophets of our time, is also a member of the Assemblies of God. Please read Billy graham exposed. I plead with you if you are involved with the Assemblies of God to get out quickly. As listed above, there are MANY different branches of this wayward group (Pentecostal, Promise Keepers, etc). I am NOT going to go as far as to call ALL of them a cult, but Benny Hinn is certainly on his way to hell. I believe that the Bible draws the line of "cult" at the moment anyone ADDS something to simple faith in Christ. For example: The Seventh-Day Adventists are a cult (a false religion) because they ADD the Sabbath day and good works to faith in Christ, which certainly is NO faith in Christ. Roman Catholicism is a cult. Lutheranism is a cult. Episcopal churches are a cult. Greek Eastern Orthodox churches are a cult. They all ADD the holy communion and baptism to faith in Christ. So I wouldn't go as far as to say that the Assemblies of God are unsaved, but they are out on left field doctrinally. Jesus NEVER said anything about "losing" our salvation. If we could lose our salvation, don't you think the Bible would have much more to say about the matter. The FACT is that the Bible has NOTHING to say about losing one's salvation. Those who "fall from grace" are those who have rejected the gospel and is so doing have damned themselves. No believer can ever fall from grace. Once a person is saved, they are SAVED FOREVER. Then Bible is clear on this issue of eternal security. I sincerely question the salvation of anyone who believes that they have to MAINTAIN a certain level of spirituality to remain saved. I simply do NOT believe that such a person is saved. The Methodist church, United Methodist church, and Free Methodist church all believe that a person can lose their salvation if they fall away from the Lord. It is in effect, a "works" salvation. The TRUTH is that salvation is a FREE gift (Romans 5:15). A gift is received, not earned. A true "gift" CANNOT be lost or taken away if it was truly a gift to begin with. God's free gift of eternal life was paid for by the blood of Jesus Christ. Once we receive that GIFT by faith, it can NEVER BE LOST! I sincerely question the salvation of the Assemblies of God. I KNOW I am saved by the grace of God, I do NOT worry about losing what I had nothing to do with in the first place. Salvation is of the Lord, not man. Our part is to simply trust. Notice the phrase in Acts 2:11, "our tongues." The crowds heard the Apostles preach in their own native tongues, not some unknown heavenly jibber jabber. There was NEVER any heavenly languages spoken that no one understood and required an interpreter. There is a drastic difference between Biblical tongues and the heretical speaking in tongues of the Assemblies of God churches. "Yet in the church I had rather speak five words with my understanding, that by my voice I might teach others also, than ten thousand words in an unknown tongue." "How is it then, brethren? when ye come together, every one of you hath a psalm, hath a doctrine, hath a tongue, hath a revelation, hath an interpretation. Let all things be done unto edifying." The church of Corinth was your first unofficial Charismatic, Assemblies of God, Pentecostal, Apostolic Faith...church. They were an entertainment church, much like the Pentecostals churches today with their musical bands, speaking in tongues, healing services, etc. It is unfortunate when churches have to deteriorate into entertainment centers to attract new members. They try to "spectacularize" Christianity. This is why the Assemblies of God religion is so popular, it offers a lot of entertainment (a lot of weird entertainment I might add). The carnal believers in the Corinthian church were trying to reproduce the gift of tongues but they weren't in any spiritual condition to see any gifts of the Spirit. What they needs was a Billy Sunday revival. 1st Corinthians 3:1 tells us that they were carnal. This church was in bad shape, a house divided. Some said they were with Apollos. Others said they were with Paul. Still other's were claiming to be with Cephas (1st Corinthians 1:12). They were suing each other, eating meats offered to idols, allowing open adultery within the church. Should it be any surprise that they were also caught up in a speaking in tongues heresy. The speaking in tongues practiced by the Charismatics, Pentecostals and Assemblies of God are of the devil. Listen friend, God's power is not at our disposal to entertain the masses and get filthy rich. Morris Cerullo is proof of what I am saying. Cerullo is a phony, certainly no man of God. There is a spirit at work indeed, but it is the spirit of Satan. Do you really believe that God would allow his power to be abused to make a bunch of sinister ministers filthy rich? No way! 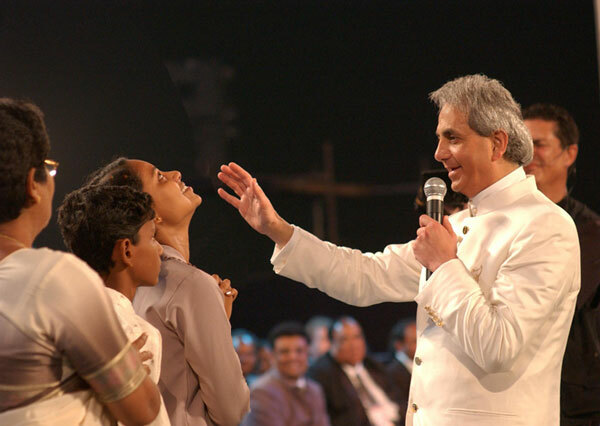 Benny Hinn is without a doubt one of the most famous heretics within the Assemblies of God organization. The Bible does teach in James chapter 5 that the prayer of faith shall heal the sick, but this does NOT give anyone a right to FALSELY use the gift of healing to make MONEY! Ever notice that the people healing has a headache for 10 years or a bad back for 15 years? I'd like to see someone get a missing hand back. Though the Bible does teach us to pray for the sick, there is NO GUARANTEE that everyone will be healed. These heretics that teach that Jesus died on the cross to guarantee us physical healing are loony. Sickness and death are the results of sin. We cannot escape sickness and death. Though God does sometimes heal the sick in answer to prayer, it is inevitable that sickness and death will eventually come knocking at our door to stay. Matthew 7:22, "Many will say to me in that day, Lord, Lord, have we not prophesied in thy name? and in thy name have cast out devils? and in thy name done many wonderful works? And then will I profess unto them, I never knew you: depart from me, ye that work iniquity." 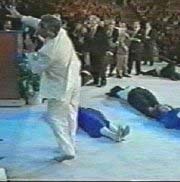 The August 10th, 2000 "This is your day" featured an extraordinary clip from the recent Chicago crusade where Benny Hinn casts the fire of the Spirit on portions of the audience, and many are "slain," falling in large groups. Pentecostal bodies believe one of the results of being overtaken by the Holy Spirit or 'slain in the spirit' is a phenomena known as 'Holy Laughter' in which the spirit-filled believer breaks out in uncontrollable laughter as a means of praise and worship to the Lord, while others dance uncontrollably around the church building even during the worship service. This is absurd and surely of the Devil. The Apostle Paul clearly warned us that everything in the church should "be done decently and in order" —1st Corinthians 14:40. I can't help but think that the participants themselves often burst out in uncontrollable laughter because they know it's all a big joke and a farce. It's hard not to laugh just watching them act like idiots. And the funniest thing (and saddest) is that millions of people naively fall for this kind of deceit and send in their money to support these shenanigans. The Assemblies of God are a carnal bunch, twisting the Scriptures to meet their own agendas. However, the Word of God still stands true. Sadly, the Assemblies of God use the perverted New International Version (NIV, or better yet... HIV) of the Bible. There are many other doctrinal problems with the Assemblies of God and their associated spin-off groups, but these are the major heresies that NEED to be EXPOSED! I would strongly plead with you to leave the Assemblies of God if you are involved with this wayward carnal group. Why join the church at Corinth when there are many decent Independent Fundamental Baptist churches that you can join.